So it’s time to add a new addition to the family. Your kids really want a dog and you think it is finally time. But what kind of dog should you get? In theory, almost any dog has the potential to get along with children. Should you just let them choose what kind they want? There are many factors that affect a dog’s ability to get along well with children, no matter their breed. Here are some factors to keep in mind. Obedience training is essential for any dog you bring into your home. There needs to be someone in the house that can spend a lot of time training your new dog, especially if it’s a puppy. Not only will your dog need to be trained on how to behave, but your children will need to be taught how to act around dogs. If your child wishes to assist in training the new dog, always have an adult supervise them. 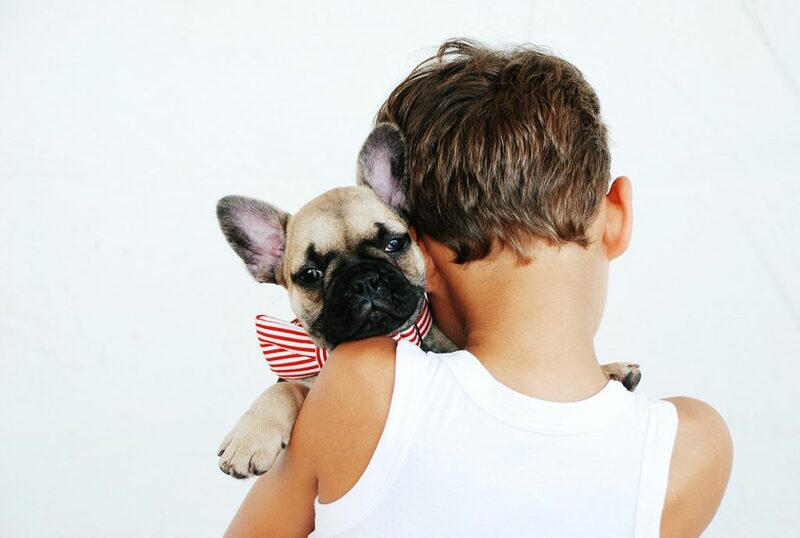 The ages and activity levels of your children matter when you pick a dog. An awkward, gangly puppy can easily knock over toddlers. On the contrary, small dogs are more fragile and might be more comfortable around older, more cautious kids. Large dogs may feel best playing with your older children, but they also need regular walks or a large yard to run around in. Before choosing a dog, make sure your families circumstances fit the size of your new pet. If you are unsure about a puppy, consider getting an adult dog that has been around children. While breeds may have a personality standard, different dogs have different personalities. Your pet’s personality should fit in alongside your family’s. In general, a family with kids needs an intelligent dog with a good temperament and moderate energy level. This dog should be gentle with children, sturdy enough to handle the heavy-handed pets and hugs they give, and not be bothered by running, screaming children. Do your children never seem to run out of gas? Try pairing them with a beagle. Active kids who never tire of playtime will get along well with these clever, friendly dogs. Beagles are eager to learn and thrives with training from their owners. They get along with nearly everyone they meet, including other dogs. Their moderate size makes them great for families in tight quarters. They are also sturdy enough that you don’t have to worry about your children hurting them. Beagles need a lot of exercise. They have been known to wander off on adventures if you do not keep a close watch on them. Beagles are also known for their loud barks, so warn your neighbors before bringing one home. Also, teach your children to not give them table scraps because they have a tendency towards obesity. Boxers are another energetic dog, but they are also playful, affectionate, pack-oriented, and love kids. If you are an active family, a boxer will be your speed. If you always wanted a reliable watchdog who is devoted to loving and protecting the members of your home, this is the dog for you. Boxers are outgoing, love to play with adults and kids alike, and love other pets. They are also attentive and good at taking direction. They will happily keep watch over your entire family. Just make sure you give your boxer plenty of exercise. These dogs are prone to barking, digging, and can be high-strung when they have pent-up energy. Golden Retrievers are known for their patience. Personality wise, these dogs are loyal, intelligent, and have great temperments. They are laid back dogs that are tolerant of tail and ear pulling by small children. Golden Retrievers are highly trainable and are a long-standing family favorite. They love playing so much that they will spend hours running around with your child. Golden Retrievers need active families. They require quite a bit of exercise, otherwise, they will get into mischief. You also should get used to picking up large tumbleweed-like dust bunnies, because they are known for their excessive shedding. Poodles are wonderful if anyone in your family has allergies. They are happy to play with your kids, but are not overly energetic, so you don’t have to worry about getting worn out. Plus, you have your choice of size (toy, miniature, or standard). Standard poodles or miniatures are intelligent and eager to please. Poodles have a great temperament and will be loyal to your family, making them great watchdogs. While poodles are fluffy, they actually have hair, not fur. They also shed very little, meaning a clean apartment and no troubles for kids with allergies. Something that should be noted is that these dogs need regular grooming to keep their coat healthy. With mixed breeds, you get the best of both worlds. Some of the more outlandish characteristics of purebred breeds will be softened with a mixed breed dog. They also tend to be healthier than purebreds and are the dogs most in need of rescue. When choosing a mutt from a shelter, workers will often be able to tell you in detail about their personalities and histories. You will have an even better chance of choosing a dog that will fit in with your family and get along with your kids. Plus, choosing a medium-sized dog will mean they are not too big to overwhelm your kids, and you don’t have to worry about your kids injuring them. May 3, 2018 in Dog Care. ← Are Bones Safe For Dogs?